This is the fourth in this blog post series, looking at how innovations in power distribution are helping facility teams take full advantage of trends in energy decarbonization, decentralization, and digitization. New capabilities are helping organizations meet efficiency and sustainability goals without sacrificing power reliability, safety, productivity, or comfort. In this post, we’ll look at how new analytic applications and services are helping facility teams use a proactive approach to uncovering potential risks and finding opportunities to optimize costs and efficiency. The last posts have shown that having a new breed of smart, IoT-enabled devices connected throughout your power distribution system will bring data from across your building or campus. The inevitable result of having so many smart sensors at so many points is ‘Big Data’. Fortunately, advanced analytic software is available today that will sift through all this data and help convert it into actionable power and energy information for corporate, facility, and maintenance leaders. Power analytic tools help visually isolate the source of problems to speed up response time. They can also help balance loads and uncover losses or spare capacity. Safely maximizing the use of your electrical system’s capacity can avoid possibly overbuilding and installing unnecessary equipment upgrades. New innovative predictive breaker aging analytics account for contact wear and operational cycles, but also environmental conditions. Predicting equipment conditions in this way makes for better capital planning, as teams can perform repair or replacement only when required. Also, sensors can detect changes out of the normal operating conditions, such as thermal increase, that can premature aging of the medium voltage equipment. Additionally, it can improve service continuity by catching high-risk situations before failures can occur. Energy costs can be allocated to tenants or departments, helping encourage energy-efficient behaviors. Enterprise-wide energy consumption and GHG emissions can be compared floor-to-floor or building-to-building to reveal energy waste. Data from building management systems can be integrated to identify settings that could be optimized. Performance baselines can be set to track progress against and validate the savings from efficiency upgrades or initiatives. Deloitte notes that such sustainability reporting can not only help buildings reduce their carbon footprint, but also differentiate themselves in the marketplace. More advanced solutions offer energy modeling and prediction. These integrate energy pricing and weather forecasts, then provide organizations the necessary decision inputs to automated peak shaving or load shifting to optimize energy costs and possibly avoid demand. High accuracy energy metering data can be used to validate utility bills to uncover any potential errors. As noted in the previous post, dedicated applications are now available that simplify participation in programs such as demand response. Signals from the smart grid are received, evaluated, then acted on by coordinating the facility’s energy resources. They can also determine the best times to self-consume renewable energy resources or recharge onsite energy storage based on energy pricing and other factors. These new analytic tools are available today to facility teams. Taking this one step further, ‘managed services’ give facilities additional power management expertise they may not have in house. Basic service levels can include reliability and efficiency improvements. More advanced options may include energy contract optimization and energy sustainability measures, including help achieving ISO50001 energy management certification and LEED ratings. In this blog post series, we’ve seen how new, smarter power distribution systems are giving facility and maintenance teams more insight and control. Digitization, connectivity, and advanced analytics have converged to improve asset management, reliability, operational efficiency, and sustainability. Facility performance can be pushed further by integrating power and building management systems. And cloud-based apps can act as a services enabler, extending expertise and support without the need to increase in-house staffing. You can see how smart power distribution is at the core of a smart building or campus. Smart buildings and districts are also contributing to a flexible and sustainable grid ecosystem through demand-side energy integration. 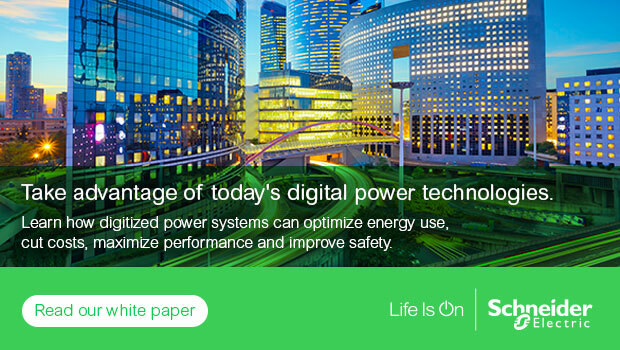 Schneider Electric is a leader in smart power distribution, offering a range of unified, simplified solutions including power monitoring and control software such as EcoStruxure™ Power Monitoring Expert and Power SCADA Operation, and energy analytics software such as EcoStruxure Facility Advisor (formerly Facility Insights). We also offer expert services that support the entire building and power distribution life cycle, from design and build through operation and maintenance. I also believe that it is really amazing how the world changed so fast. I believe that many businesses or companies get a lot of advantages from new innovations in the present time and I also believe that Power Management System will be different as well. Thanks for sharing this article.